This a best practices guide for beginners that are thinking of setting up an EOS account. 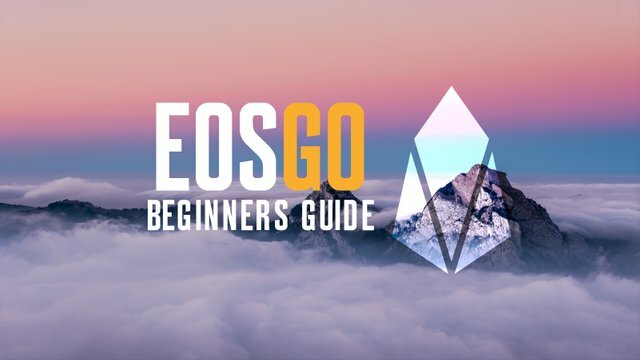 It is also a guide for those that currently own an EOS account and wish to learn more about it. Please note, this guide is aimed at those that wish to protect their own EOS assets, and therefore, these tips are not applicable to those that hold their EOS on an exchange. By definition, if your EOS is held on an exchange you do not own any EOS, you only have an IOU from an exchange and are vulnerable to fees, overarching regulations, and hacks. For a guide on how to move your EOS off an exchange and into a secure wallet, please read this article by EOS New York. If you are a super beginner, we suggest EOS Canada’s excellent dictionary of EOS terms ABCs of EOS. After reading the terms in this dictionary, you will have the lexicon needed to understand many of the terms used in this article. If you would like to learn about best practices for securing your account, please read our article “EOS BEGINNERS: Account Security Best Practices”. This article will cover the following topics. Please navigate with regard to your experience level and need. WHAT ARE ACTIVE AND OWNER KEYS? WHAT ARE RAM, CPU AND NET? WHAT DO “STAKE” AND “UNSTAKE” MEAN? An EOS account is a readable name that is stored on the EOS blockchain and connected to your “keys”. An EOS account is required for performing actions on the EOS platform, such as sending/receiving tokens, voting, and staking. These keys ensure that only you can access and perform actions with your account. Your public key is visible by everyone using the network. Your private key, however, will never be shown. You must store your private keys in a safe location as they should not be shared with anyone (unless you want your EOS to be stolen)! TLDR: EOS Accounts are controlled by key pairs and store EOS tokens in the Blockchain. Wallets store key pairs that are used to sign transactions. Scatter is a tool that allows users to connect and interact with the EOS blockchain (and other blockchains too). If you are familiar with MEW, Scatter is like MEW, but better. It is important to know what Scatter is and understand how to use it as it will be a touchstone tool in this article going forward. Once you set up Scatter, you will be able to sign transactions, protect your data, and interactive with apps, all without exposing your EOS keys. You can download the latest version of Scatter here. Follow the download and set up instructions and come back to this article. If you want to learn more about Scatter before downloading Scatter, you can visit Scatter’s website here. To create an EOS Account you need a key pair which consists of a private key and a public key. If you already have a key pair, please skip this section and navigate to HOW TO CREATE AN EOS ACCOUNT. There are many ways to create a key pair, but we recommend Scatter Desktop OR the Ledger Nano S.
Scatter is one of the most used EOS wallets. It allows users to sign transactions to both web and desktop applications without ever exposing your keys or filling out forms. Everything in your Scatter is stored locally on your device. Open Scatter and Set up a Scatter password (you will use this password every time you access Scatter). Save the mnemonic phrase — this mnemonic phrase is only used for Scatter Backups! Not for you EOS Accounts! Go to the Scatter Homepage and click on Vault > New > Create New. Scatter will now generate a new key pair which you can rename as you wish. 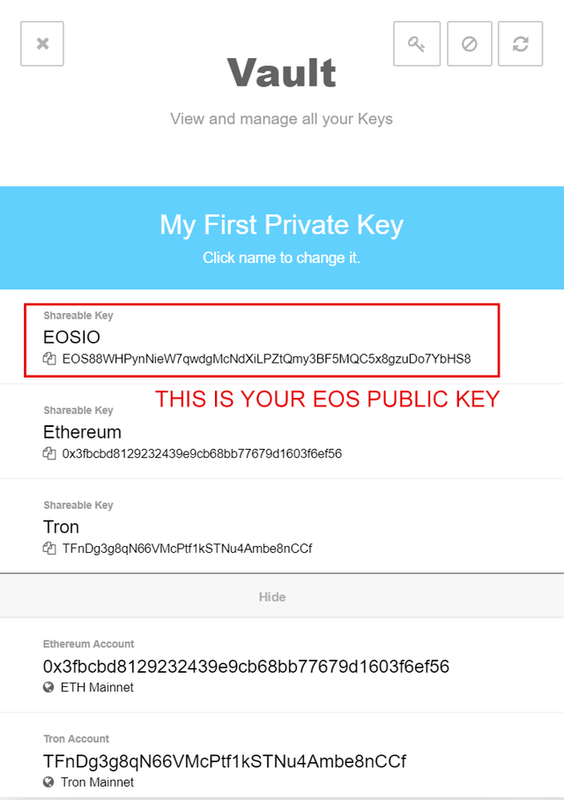 To see your Public Key, click on “Show Public Keys” and check the EOSIO field. GIF Tutorial: Generating a key pair. Then if you would like to copy your private key, you just need to click on Export Private Key and follow the provided instructions. END OF INSTRUCTIONS FOR GENERATING A KEY PAIR VIA SCATTER. Download and Install the Ledger Live app. Open Ledger Live and install the EOS application. The Ledger Nano S comes with a private key already stored on the device, so you don’t need to generate a key pair. Instead, you need to attach the key pair from Ledger to Scatter without ever exposing the private key. Download and Install Scatter Desktop from: https://get-scatter.com/. Open Scatter and set up a Scatter password (You will need this every time you access Scatter). Select “Ledger Nano S” and attach your hardware wallet to your computer. GIF Tutorial: Connecting your ledger Nano S to Scatter. One of the easiest ways to create an EOS account is by using the EOS Lynx app, with your iOS or Android device, OR by using MyEOSKit where you can buy EOS on an exchange and then send that EOS to a Smart Contract. Follow the instructions in the links provided to make an EOS account. Copy the private key that EOS Lynx gave you when you were creating your EOS account. Click on Vault > New > Import > Text and paste the private key in the correct field. Scatter will now load the EOSIO Account linked to that key pair. Done! You can now use the EOS account you created with EOS Lynx on Scatter, allowing you to interact with DAPPS. You can look for dapps on DappRadar. GIF Tutorial: How to import a private key to Scatter. These are the keys that you should use for your daily operations. This private key tends to be used for tasks like transferring funds and voting. Active keys can’t be used to change the owner private keys. If the active key has been compromised, you can change it using your OWNER key. Owner key = ownership of an account. The owner key will allow you to do anything that the active keys do. But in addition to this, owner keys will allow you to change both the account’s owner and active keys. This is sort of like how some websites will require you to enter your old password before you update your account to have a new password. Every EOS account has at least two types of permissions; owner permissions and active permissions. Each transaction needs to be verified and signed by one of these permissions to be considered valid. Transactions are signed by a wallet that stores key pairs associated to your accounts. This means wallets protect and make use of the keys that control your EOS accounts. There are three types of wallets: hardware wallets, software wallets and paper wallets. Hardware wallets are the safest means for storing your keys. You purchase a physical device which generates and holds your key information for you. This protects your keys even if you are using an untrustworthy computer. The Ledger Nano S is one of the most used Hardware wallets. Software wallets are based on computer software. Your keys will be stored locally on your device, allowing you to control your keys from you computer, laptop, phone, etc. However, if your computer gets hacked you risk losing your keys, and consequently, your funds. Scatter and Greymass are two Desktop wallets, while EOS Lynx and Meet.One are two mobile wallets. Paper wallets are a printed QR codes that contain your private key information. Paper wallets are considered one of the most secure options to store private keys as they are not connected to the internet and cannot be hacked. Another plus is that they are practically free as you can print them out on paper via a printer. However, it is still risky to import a private key into a compromised computer. If you want to create a paper wallet, you can create the QR code from your private key on Scatter. RAM is a resource that developers must purchase (with EOS tokens) to run applications on the EOS blockchain. RAM is used to store data in an in-memory database. DAPPs will use RAM to store state information so it is quickly available via their application. Users have 8kb of RAM from the snapshot and this will be all they need. If you are a DAPP or you are creating accounts, then you’ll need to purchase more RAM. CPU and NET are two types of resources that your account needs to perform actions on the EOS blockchain. CPU is measured in µs (microseconds) and NET is measured in KB (kilobytes). By staking EOS tokens, you will increase your CPU and NET limits. If you’re using all of your allotted CPU or NET, then you won’t be able to perform any more actions and will need to wait until your usage levels come down. Your usage levels will automatically decrease over time, returning to a minimum level after about three days. Therefore, staking is essentially a rate-limiting mechanism. That is, if you need to perform more actions in a short amount of time (e.g. if you’re running a DAPP that handles many transactions per second), you will need to stake much more EOS tokens. These tokens are not spent — they are only staked or “parked,” and you can unstake them any time. After your create an account, it will have a limited amount of resources: 0.1 EOS staked on CPU, 0.1 EOS staked on NET, and 3kb of RAM circa. With this amount of resources, it will probably not be possible to make any transaction, therefore you need to stake some EOS. When you stake your EOS, you’re “parking” your tokens. Your tokens will not be accessible until you decide to unstake them. Staking is essential in EOS because it grants you account resources (CPU and NET) that are required to perform any actions on the blockchain. When you stake for bandwidth, you will be allowed to send more transactions within a period of time, as the size of transaction consumes bandwidth. To use the network, an average user will only need to have 1 or 2 EOS staked. However, the amount of EOS staked is also your voting power. Only staked tokens contribute to voting power when you vote for Block Producers. When you decide to have your EOS in “movable” form, you will have to go through the unstaking process. Once you unstake the tokens, you will have towait three days for those tokens to be transferred from your staked balance to your unstaked balance, at which point you can transfer them at will. Open Scatter Desktop and sign in with your Scatter password. Select the keypair for the account you want to stake your EOS. Click on your EOSIO Account name. Click on Moderate CPU or Moderate NET if you want to stake CPU or NET. You usually need more CPU than NET. Select the amount of EOS you want to stake and click Stake. You are also allowed to stake your EOS and delegate them to another account, to do that you can use Scatter + MyEOSKit Stake tool. Remember that when you stake your EOS it takes 3 days to unstake them, for this particular reason staking can be used for security purposes. If your account should ever be compromised, you will have 3 days to change the key pair that controls your account! TLDR: Stake most of your EOS, and only leave the amount of EOS liquid that you would be willing to “lose” in case a hack occurs. If you stake your EOS, but need to use your EOS (ex: you want to send them to another account, you want to use them to buy something, etc) you will have to unstake your EOS. Unstaking your EOS takes three days. After that you are free to send/use your EOS as you wish. CONGRATULATIONS! You have completed our EOS BEGINNERS: Anatomy of an EOS Account. If you have any questions be sure to ask us in the comments, or join our Telegram community to get customer support: [https://t.me/EOSGo] (https://t.me/eosgo). Now that you understand the nuts and bolts of an EOS account, consider reading our beginner’s guide, “EOS BEGINNERS: Account Security Best Practices”. EOS GO is powered by YOU. Join the community and begin contributing to the movement by adding eos go to your name and joining the EOS GO telegram group. Thanks for posting this! Really helps a lot. By far, for me anyways, this article is one of the most explanatory and well guided post about EOS. It was so confusing when iy had the presale token and all and I've been wondering where would be the best place to 'stake' it.